A new set of four decimal postal fiscal stamps were printed in July 1967 to coincide with the introduction of decimal currency. 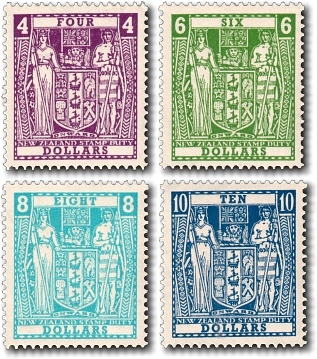 All four values were authorised for and typically used for postage purposes. Distinguishing postally and fiscally used stamps can be quite tricky. All stamps with pen cancellations, punched holes or embossing are fiscally used. Stamps should be inspected under ultraviolet light to see if a fiscal pen cancellation has been removed. Embossed designs were frequently employed on documents and attempts to iron these out have been noted in the past. If the stamps have been postmarked, fiscal cancellations give the region while postal cancellations give the individual post office where the mail was cancelled. Simple circular date stamps with no region or place, and circular 'Stamp Duties Dept' or 'Inland Revenue' date stamps on Arms issues are fiscal cancellations, and if only the outer ring of the cancellation is visible on the stamp it is safest to assume you have a fiscal cancellation.